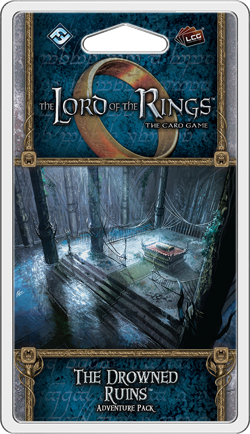 Fantasy Flight Games is proud to announce the upcoming release of The Drowned Ruins, the fourth Adventure Pack in the Dream-chaser cycle for The Lord of the Rings: The Card Game! 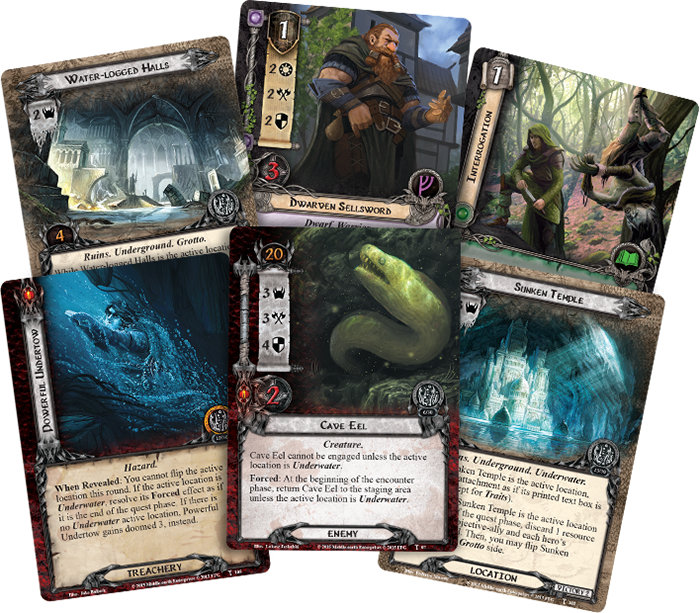 As throughout most of the Dream-chaser cycle, the exploration of The Lord of the Rings: The Card Game comes to the fore in The Drowned Ruins. As the scenario challenges your heroes to find their way through a maze of natural caverns, it incorporates a Grotto deck of nine double-sided Grotto locations that you set aside from the rest of the encounter deck at the beginning of the game. On one side of each of these cards is a Grotto location. On the other side is an Underwater location. Whenever you travel to a Grotto location, you can trigger its Response effect and flip it to its Underwater side. Doing so discards all the progress you may have placed on the Grotto side, but it helps you get closer to your ultimate goal. In order to get through the scenario's first quest stage, you must successfully travel through three Underwater locations, adding them to the victory display. But travel through the murky depths is both difficult and dangerous. 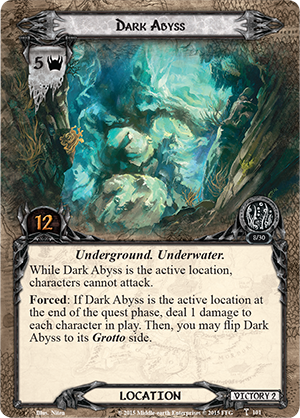 Each of the nine Underwater locations in the Grotto deck requires you to make ten or more progress to clear it, and each has a terrifying Forced effect that reinforces the idea that your heroes are unable to pause or take a breath. For example, the Dark Abyss (The Drowned Ruins, 101) deals one point of damage to each of your characters at the end of the quest phase. That's an effect that's bound to keep you moving forward, especially when you consider that the quest restricts you even further, preventing you from playing new allies or attachments while your heroes are Underwater! 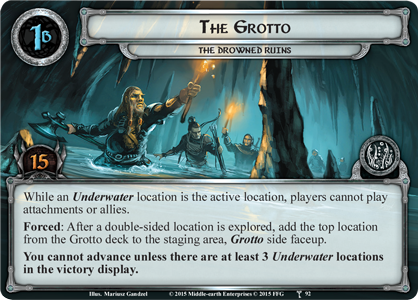 Since the Grotto locations you explore don't go to the victory pile, but instead go back to the Grotto deck, your passage through the cold waters of The Drowned Ruins is bound to be punctuated by long, desperate swims and returns to the surface to try to catch your breath, heal, and resupply. 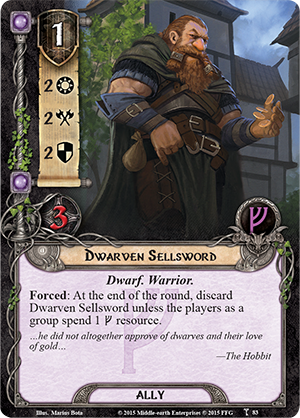 Of course, your journeys in The Lord of the Rings: The Card Game are never just about moving through a series of locations, and the watery caverns of The Drowned Ruins are naturally full of enemies and treachery cards that you will have to face along your way. In addition to its scenario, The Drowned Ruins contains a new hero and twenty-seven new player cards (three copies of each). 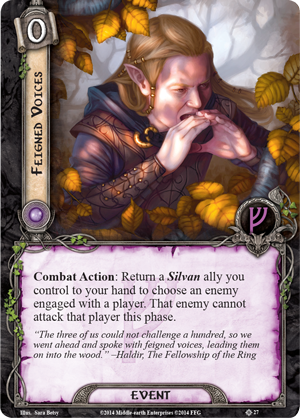 Among these player cards are a wealth of new allies, events, and attachments, including several new Silvan cards that may very well help you negotiate the scenario's watery passages. 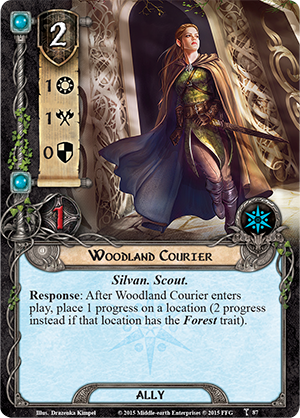 Even though the Woodland Courier (The Drowned Ruins, 87) will no doubt feel out of place in the scenario's dark and sunken tunnels, she can still help you make swift progress along your chosen path. 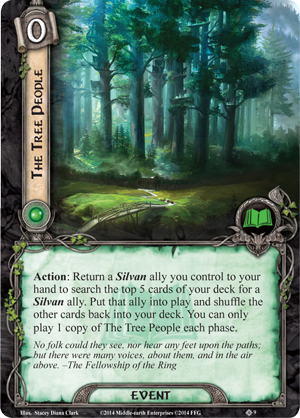 In fact, the woodland Silvan may even surprise you as some of the best traveling companions you could hope to find for this specific journey. After all, their abilities tend to trigger when they enter play, meaning you'll often find The Tree People (The Dunland Trap, 9) bouncing in and out of play, and anything that bounces these allies into play rather than requiring you to play them from hand can allow you to bypass the Stage 1B restrictions on playing allies and attachments. Accordingly, if you play a Woodland Courier and then travel Underwater, you may still be able to return her to your hand with Feigned Voices (The Three Trials, 27) in order to prevent an enemy from attacking you. 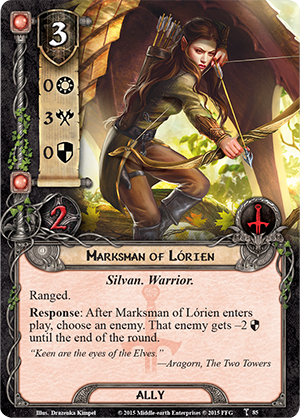 Alternatively, you might defend that enemy with a different character and then use The Tree People to return your Woodland Courier to your hand in hopes of getting a Marksman of Lórien (The Drowned Ruins, 85) into play from the top of your deck. 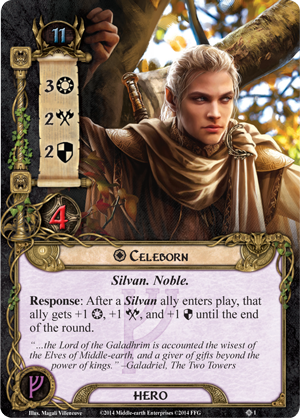 After all, if you succeed, you'll reduce the enemy's Defense strength by two, meaning there are very few enemies your Marksman cannot help you defeat the round he comes into play, especially if your fellowship includes Celeborn (The Dunland Trap, 1). If your heroes can survive their journeys, what will they discover? Part of exploration is the mystery of discovery, and you'll find both exploration and mystery in abundance in The Drowned Ruins. Look for this fourth Adventure Pack in the Dream-chaser cycle to arrive to retailers in the second quarter of 2016!